For the final lunchtime concert in our winter series, on Thursday 7 July, we welcomed the National Youth Choir of Australia (NYCA), under the direction of internationally acclaimed UK conductor David Hill (BBC Singers, The Bach Choir). NYCA is made up of top young choral singers from around the country between the ages of 18 and 26, who meet in a different city each year for a week of intensive rehearsals followed by a series of performances. 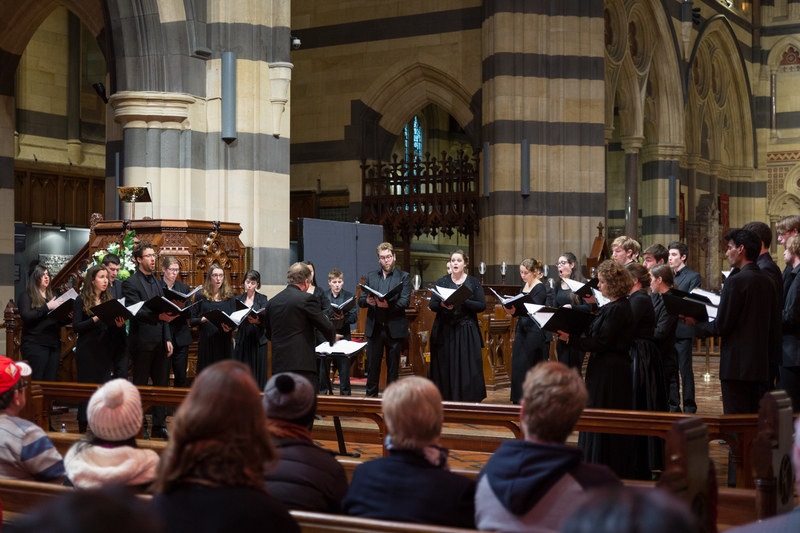 This year’s programme included works by contemporary Australian composers Paul Stanhope and Joe Twist, the beautiful but seldom-sung requiem of 20th century Italian composer Ildebrando Pizzetti, and Edward Cowie’s ‘Lyrebird Motet’, in which the vocal lines cleverly mimic the bell-like sounds of the bird. The precision and musicality of the performance were remarkable – particularly given the broad range of genres and the short rehearsal period – and were warmly appreciated by the audience. The next series of lunchtime concerts at the Cathedral will commence on Wednesday August 10. Keep an eye on our website for details.